The plan was to read 52 books in 52 weeks, from 12 categories. My intention was to broaden my reading. I have a tendency to only read books that are in my favourite genre (dark, thrillery fiction) and I wanted to mix it up a little. I kept track of my reading on the paper you see below. I hung it on the side of my fridge, and I think that it helped keep me organized and motivated. 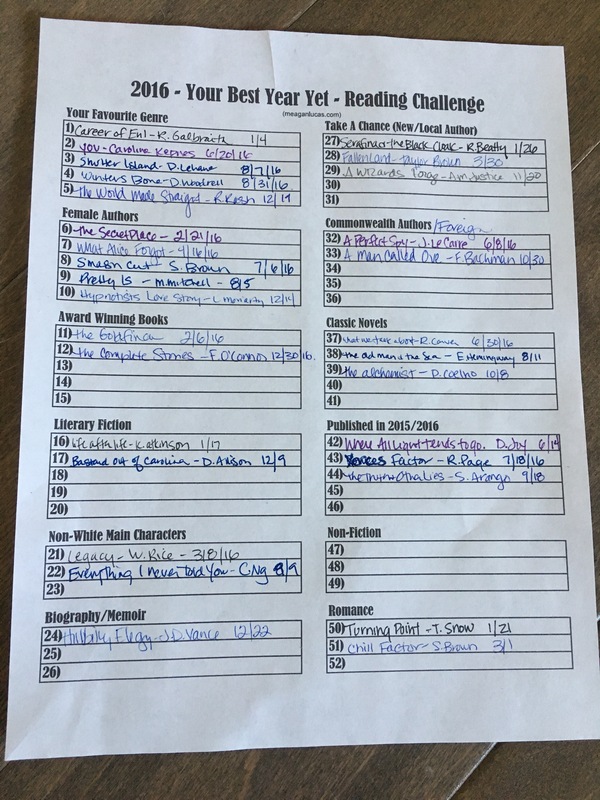 (I’ve made one to track my 2017 Reading Challenge books too, but I’ll tell you about that in another post. :)) As you can see, I fell short of my 52 books. I’m kind of sad about that, but at the same time, life is crazy and I would rather enjoy a book than race through it just to finish. I’m also a little disappointed in myself that I leaned pretty heavily on old favourites – genre and female writers. But I do feel pretty good about the new authors that I read this year, and the books with not-white main characters. When your reading time is precious, it’s easy to go back to authors you know you like, and I would definitely add A.M. Justice and Waubgeshig Rice to my future to-read pile. I would have to add Autumn Birt to the top of that list. Her world building is Sublime. She will draw you right in and before you know it you’re walking along beside one of the characters.